The third time we have visited this festival, it was as great as ever. The weather was resonably kind, just some rain on the Friday evening. Cheltenham is a lovely town for a festival, and the Town Hall is just an excellent venue. Many artists (some featured in the video here) and many, many guests (some also in the video). 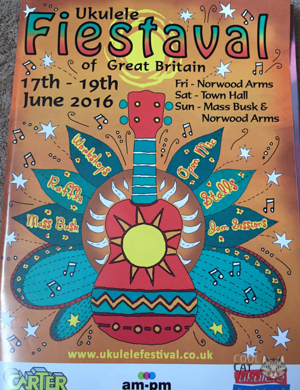 With open mics, a stage at the Norwood Arms pub on the Friday, then on the main stage on the Saturday afternoon : Ukulele Funhouse Orchestra, Dead Mans Uke, Jane For Tea, Barada Street (how to mix acrobatics with ukulele), Daniel Ward, Nico'o and the Kapiolani Boyz. Then in the evening : Uff & Zaza, Aldrine Guerrero (with three standing ovations), Shine, The Ooks Of Hazzard and the Jive Aces, it just got better and better. A good range of stalls in the merchandising area, the only point that really needs improving was the general merchandising table during the evening concert - I went to buy a Shine CD, to find only Jive Aces CDs available, no other artist CDs at all - nor stickers, or other merch - normally Dead Mans Uke have all sorts of things avaialble! I was only able to buy a CD because I bumped into Chino from Shine himself! You have to wonder how many of the artists missed out on sales. Something to fix for next year. Filmed entirely on location in Cheltenham.